Videomicroscopy systems are used to examine functional properties of isolated adipose tissue arterioles in response to physiological and pharmacological stimuli. This technique can be used to examine microvascular phenotypes in different adipose tissue domains in obese humans. Farb, M. G., Park, S. Y., Karki, S., Gokce, N. Assessment of Human Adipose Tissue Microvascular Function Using Videomicroscopy. J. Vis. Exp. (127), e56079, doi:10.3791/56079 (2017). While obesity is closely linked to the development of metabolic and cardiovascular disease, little is known about mechanisms that govern these processes. It is hypothesized that pro-atherogenic mediators released from fat tissues particularly in association with central/visceral adiposity may promote pathogenic vascular changes locally and systemically, and the notion that cardiovascular disease may be the consequence of adipose tissue dysfunction continues to evolve. Here, we describe a unique method of videomicroscopy that involves analysis of vasodilator and vasoconstrictor responses of intact small human arterioles removed from the adipose depot of living human subjects. Videomicroscopy is used to examine functional properties of isolated microvessels in response to pharmacological or physiological stimuli using a pressured system that mimics in vivo conditions. The technique is a useful approach to gain understanding of the pathophysiology and molecular mechanisms that contribute to vascular dysfunction locally within the adipose tissue milieu. Moreover, abnormalities in the adipose tissue microvasculature have also been linked with systemic diseases. We applied this technique to examine depot-specific vascular responses in obese subjects. We assessed endothelium-dependent vasodilation to both increased flow and acetylcholine in adipose arterioles (50 - 350 µm internal diameter, 2 - 3 mm in length) isolated from two different adipose depots during bariatric surgery from the same individual. We demonstrated that arterioles from visceral fat exhibit impaired endothelium-dependent vasodilation compared to vessels isolated from the subcutaneous depot. The findings suggest that the visceral microenvironment is associated with vascular endothelial dysfunction which may be relevant to clinical observation linking increased visceral adiposity to systemic disease mechanisms. The videomicroscopy technique can be used to examine vascular phenotypes from different fat depots as well as compare findings across individuals with different degrees of obesity and metabolic dysfunction. The method can also be used to examine vascular responses longitudinally in response to clinical interventions. Videomicroscopy is a useful technique utilized to examine the vasomotor function of small arterioles removed from living human subjects ex vivo. Our laboratory has focused on dissecting out tiny microvessels from different adipose tissue compartments to characterize the effects of various adipose microenvironments on the microvasculature. A major advantage of this technique is that blood vessels removed from the human body remain functional and can be examined readily within minutes to hours following biopsy. Physiological conditions are mimicked and steady transmural pressure maintained in the intraluminal space via micro-glass cannulas which recapitulate many in vivo characteristics.1,2 Additionally, a reliable videomicroscopy set-up with automated edge detection software allows for both qualitative and quantitative assessment of endothelium-dependent and -independent vasodilator and vasoconstrictor capacity of isolated vessels in real-time, permitting rapid physiological assessment in response to physical and pharmacological stimuli.3 Other microvascular techniques are also available such as wire myography which tends to be less time consuming and measure tension responses to various agonists by a force transducer. The functional assessment of isolated adipose tissue arterioles is a useful approach to gain understanding of the pathophysiology and molecular mechanisms that contribute to vascular dysfunction in human obesity. To investigate mechanisms that contribute to fat depot-specific dysfunction, we have developed methods to examine endothelium-dependent and -independent vasodilatory responses of the microvasculature, and evaluate the expression of various regulatory candidates in paired visceral and subcutaneous (SC) fat tissue specimens obtained from obese subjects at the time of bariatric surgery. The protocol and examples described here were approved by Boston University School of Medicine Institutional Review Board (IRB, protocol #H-25644) and were conducted in accordance with the Declaration of Helsinki. All subjects provided written informed consent before participation. Prepare the 4-2-hydrosyethyl-1-piperazineethanesulfonic acidic saline (HEPES) solution. For 1 L, dissolve 8.059 g NaCl, 0.298 g KCl, 0.296 g MgSO4•7H2O, 0.235 g CaCl2•2H2O, 0.16 g KH2PO4, 0.01 g EDTA, 1.081 g D-Glucose, and 2.383 g HEPES acid in 950 mL of deionized water. Make up the volume to 1 L with deionized water. Adjust pH to 7.4 using NaOH. HEPES buffer can be stored up to 7 days at 4 °C. Prepare the 20x Salt Buffer Stock. For 1 L, add 143.8 g NaCl, 7.0 g KCl, 5.9 g MgSO4, and 7.4 g CaCl2•2H2O into 900 mL of distilled water. Make up volume to 1 L with deionized water. Store stock solution at 4 °C. Prepare the 20x Buffer Stock. For 1 L, add 26.8 g NaHCO3 and 0.2 g EDTA·2H2O into 900 mL of deionized water. Make up volume to 1 L with deionized water. Store stock solution at 4 °C. Prepare the KREBS Solution to be used during the physiological experiments. For 1 L, add 900 mL of deionized water, 50 mL of 20x Buffer Stock, 50 mL of 20x Salt Buffer Solution, 0.99 g D-Glucose and 0.16 g KH2PO4. Adjust pH to 7.4 using HCl. To maintain pH of the buffer, stir constantly and cover with paraffin or bubble continuously. Check the pH every 20 min. Make the KREBS solution fresh daily. Make micro-glass cannulas with an internal diameter of 40 - 240 µm using a commercially available needle/pipette puller. The size of glass cannulas is determined by the size of the internal diameter of isolated blood vessels (50-350 µm). Alternatively, purchase micro-glass cannulas of the pre-determined size. Prepare the acetylcholine (Ach, 10-2 M, stock solution). Dissolve 18.29 g in 10 mL deionized water. Store 1 mL aliquots of stock solution (10-2 M) at -80 °C. On the day of the experiment serially dilute to obtain the following working concentrations: 10-5, 10-6, 10-7,10-8, 10-9 M.
Prepare the papaverine (2 x 10-2 M, stock solution). Dissolve 0.07517 g in 10 mL deionized water. Prepare 10 µL aliquots of stock solution and store at -80 °C. Serially dilute to obtain 10-4, 10-5, 10-6, 10-7, 10-8 M on the day of the experiment. Prepare the endothelin-1 (ET-1, 2 x 10-5 M, stock solution). Dissolve 50 µg endothelin-1 in 1 mL of 1% BSA/PBS. Store 1 mL aliquots of stock solution (2 x 10-5 M) at -80 °C. On the day of the experiment dilute to obtain a working concentration of 10-10M on the day of experiment. Store reagents in either -20 °C or up to -80 °C depending on type of freezer available, but not longer than 6 months. Recruit obese men and women (body mass index (BMI) ≥ 35 kg/m², age ≥18 years) enrolled in the bariatric surgery program at Boston Medical Center (BMC). A total of 40 subjects participated in these experiments. Collect subcutaneous and visceral adipose tissue samples during planned bariatric surgeries by the surgeon performing the operation. Harvest the subcutaneous adipose tissues from the lower abdominal wall and visceral fat from the greater omentum, respectively. Typical fat tissue sample size varies from 3 - 10 mg of tissue. Place tissues immediately in cold HEPES buffer solution with a pH of 7.4 and store at 4 °C for up to 24 h.
NOTE: Additionally, adipose arterioles can be obtained from lean individuals as well during other types of surgeries such as hernia repairs or plastic surgery, and can also be biopsied from the subcutaneous depot via trans-cutaneous abdominal fat pad biopsy6. Using a tissue dissection microscope, micro-scissors and micro-forceps, carefully remove surrounding fat and connective tissue from the small adipose arterioles (50 - 350 µm intraluminal diameter, 2 - 3 mm in length). Tie off all branches on the arterioles using tiny nylon or silk sutures before cannulating on the glass capillary pipettes. Carefully dissect the arterioles since even minor damage of the arteriole wall causes significant functional changes. Minimize vessel exposure to light and heat as it may cause vasodilation. Since it can be sometimes difficult to distinguish arterioles from venules, identify the size and smooth muscle tone of vessels by nipping the tips of the vessels. Arterioles are usually smaller and demonstrate greater tone compared to venules. Prepare the organ chamber. Slowly fill the glass capillary pipettes and rubber tubing with KREBS solution using a 10 mL syringe. Once rubber tubing is filled and glass capillary pipettes are submerged in KREBS solution within the organ chamber, cannulate the arterioles securely on the secured pipettes and tie both ends of the arteriole with nylon or silk suture knots carefully. Fill up the organ chamber with KREBS solution up to 2 mL. Secure the organ chamber onto a stage with the inverted microscope (magnification 10X/0.25 objective) and video camera. Turn on the edge detection software that is streamed in real-time at a sampling rate of 1 kHz (1 frame/s). Connect one side of the pressurized tubing to the KREBS solution filled pressure reservoirs free of microbubbles, as bubbles can introduce experimental error. Connect the other side of pressurized tubing to the organ chamber. Connect the KREBS solution filled pressure reservoirs to the pressure transducer with clean tubing. Control intra-luminal flow by regulating the height of these two reservoirs; thus, when reservoirs are placed at the same height, no intra-luminal flow will occur. Once all these processes are complete, turn on heating block and software program to maintain temperature at 37 °C. Continuously perfuse the vessel with KREBS solution and aerate with a gas mixture of 5% CO2, 21% O2 and 74% N2 7,8 throughout the entire experimental procedure. To achieve desired pressure inside the lumen of the isolated vessels gradually increase the intraluminal pressure (5 mmHg, every 5 min) via the pressure control unit in the myo-interface panel, doing so at a slow rate to avoid endothelial layer damage. NOTE: In general, adipose arteriole endothelial-dependent vasodilation can be elicited in response to physiological (flow-induced) and pharmacological stimuli (Ach-induced). Following pressurization, record the diameter of the adipose arteriole at rest (Di). This is referred to as the resting baseline diameter. Pre-constrict blood vessels to ~55% of the resting baseline diameter (Dp) by adding 1 µL of endothelin-1 (ET-1, 10−10 M) directly to the bath and wait 5 min for effect. Repeat this process until reaching the desired ~55% pre-constricted state. Following pre-constriction, induce continuous flow into the intraluminal space of adipose tissue arterioles, in equal and opposite directions so that a pressure difference can be developed across the vessel without altering the mean intraluminal pressure of 60 mmHg. NOTE: For example, if one reservoir moves up by 10 cm in height, the other one needs to be moved down by 10 cm to alter pressure gradients and thus change intraluminal flow rate. If more accurate flow rate measurements are desired, a quantitative flow-meter system can be applied to the experimental set-up. Measure flow-mediated dilation 3 - 5 min after the initiation of the flow induction. The levels of intraluminal flow (pressure gradients) can be in the range of 0 - 100 cmH2O. Increase each increment of pressure gradient by Δ10 cmH2O every 5-6 min, up to a maximum of 100 cmH2O. NOTE: In order to induce stable laminar flow in the lumen, both micro glass cannula tip sizes need to be very close to inner diameter of arterioles; otherwise, it will produce turbulent flow inside of lumen and induce unwanted measurement errors. Following the flow- mediated dilation assessment, return pressure reservoirs to the same height (60 mmHg). Then, wash arteriole and chamber by immediately removing solution from chamber and replace with fresh KREBS solution. This is done with caution as to not disrupt the suspended arteriole within the chamber. Repeat this process 3 - 4 times for 20 - 30 min, or until the isolated vessel returns to the resting baseline diameter. When the adipose arteriole has returned to the resting baseline diameter, pre-constrict vessel ~55% by administering endothelin-1 (ET-1, 10−10 M) directly to the bath, as described above in section 4.1.2. Following pre-constriction, sequentially administer increasing doses (2 µL) of acetylcholine which is a receptor-mediated, nitric oxide agonist (Ach, 10-9 to 10-5 M) directly to the bath. Record the change in arteriolar diameter 5 min after administration of each dose. Once the vessel has reached a plateau following administration of the final Ach dose, wash the vessel 3 - 4 times with KREBS solution. Allow 20 - 30 min for vessel to recover and return to resting baseline diameter. To help maintain pH in the organ camber, change KREBS solution every 15 min. Incubate the arteriole with Nw-nitro-l-arginine methyl ester (L-NAME, 10-4 M), an inhibitor of nitric oxide synthase for 30 min, and then repeat 4.2.1 and 4.2.2 to characterize the relative contribution of nitric oxide to Ach-mediated vasodilation. Assess endothelium-independent vasodilation (vascular smooth muscle function) and vessel viability by a sequential administration of increasing doses of papaverine (10-8 to 10-4 M) directly to the bath. If the vessel diameter does not return to, or exceed the resting baseline (Di) diameter in response to papaverine (i.e. appropriate vasodilation), consider the vessel non-viable and discard data points. NOTE: The inter-observer reproducibility studies of vasodilation of adipose microvessels has a high correlation coefficient (CC) of 0.99 (n = 10 vessel experiments) in our laboratory. Express continuous measurements as mean ± SEM. These tend to be normally distributed. Analyze vascular reactivity in adipose arterioles by repeated-measures two-way ANOVA. Alternatively, compare the area under the curve (AUC) of the plot for cumulative vasodilation to dose-responses between treatment groups. In all cases, consider P <0.05 statistically significant. Our laboratory has used videomicroscopy to examine endothelium-dependent and -independent vasodilation, as well as vasocontractile function of adipose tissue arterioles isolated from subcutaneous and visceral fat of obese humans. The characteristic experimental set-up is displayed in Figure 1A. Adipose tissue arterioles are suspended between two glass capillary pipettes and secured in place with sutures within the organ chamber as shown in Figure 1B. As described above in section 5.1, arteriolar responses can then be assessed by examining the vessel at baseline (Figure 2A), followed by pre-constriction with ET-1 to ~55% of baseline diameter (Figure 2B), and then agonist-induced vasodilation and relaxation of the vascular lumen as displayed in Figure 2C. We and others have observed that endothelium-dependent vasodilation responses to increased flow (shear stress)11 and Ach12 were significantly blunted in visceral compared to subcutaneous adipose arterioles (Figure 3A, 3B) in human obesity. However, endothelium-independent vasodilation in response to papaverine was not differentially altered between the two depots (Figure 3C). Together, these findings suggest that vascular dysfunction in visceral domains is largely a result of dysfunction at the level of the endothelium, at least in early stages of the disease. This technique permits systematic analysis of vasodilator responses of intact small human arterioles and can also be applied to other accessible regions of the human vasculature. The ex vivo system can be manipulated using numerous pharmacological methods such as responses to insulin as an index of vascular endothelial insulin resistance6, or dose-responses studies to nitroglycerin to test vascular smooth muscle layer function.12 Biological methods such as silencing RNA can also be introduced13 to potentially develop mechanistic frameworks for understanding critical regulators that confer vascular dysfunction under specific disease conditions. Figure 1: Videomicroscopy set-up. (A) Image depicting the components of the videomicroscopy organ chamber. (B) Image of a human adipose arteriole mounted between two glass capillary pipettes in the organ chamber. Vessel diameter changes in response to physiological and pharmacological stimuli that can be examined and quantified using specialized analysis software and an inverted camera attachment in the system. Please click here to view a larger version of this figure. Figure 2: Illustration of microvascular vasodilation using pressure videomicroscopy. (A) resting baseline arteriolar diameter (post- pressurization diameter, no agonist or stimulation: Di) (B) pre-constricted diameter (after ET-1 induced constricted diameter: Dp), (C) Agonist-induced vasodilated diameter (after Ach was added: DT). Please click here to view a larger version of this figure. Figure 3: Endothelium-dependent, and -independent vasodilation in subcutaneous vs. visceral adipose arterioles in obese humans. 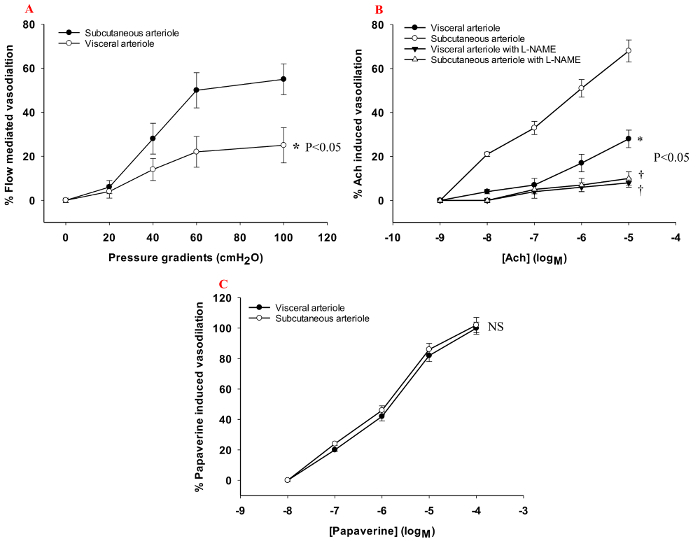 Endothelium-dependent vasodilation was significantly attenuated in visceral compared to subcutaneous adipose tissue arterioles when assessed by (A) increased flow (paired subcutaneous and visceral vessels, n = 20), or (B) acetylcholine dose response with/without L-NAME (paired subcutaneous and visceral vessels, n = 16). (C) Endothelium-independent vasodilation was not differentially altered between visceral and subcutaneous arterioles when assessed by papaverine dose response (paired subcutaneous and visceral vessels, n = 8). *Denotes group differences between depots; †Denotes depot-specific differences between acetylcholine with L-NAME compared to acetylcholine alone; NS: not significant. Data are presented as mean± SEM, p <0.05. Please click here to view a larger version of this figure. The dissection and isolation of adipose arterioles from surrounding tissues can be a time-consuming and labor-intensive process with careful attention to detail and technical protocol. The microdissection procedure requires meticulous skills and specialized dissection utensils to prevent potential damage to the smooth muscle or endothelial cell layers of the microvasculature. Even tiny accidental punctures in the arteriolar wall can prevent intraluminal pressurization and results in an unsuccessful experiment. Additionally, cannulation of arterioles utilizing sutures is crucial to secure the arterioles between the glass capillary pipette tips at each end of the vessel. Human isolated microvessels can develop spontaneous myogenic tone after 30 - 40 min of pressurization at 60 mmHg. However, we found that human adipose arterioles generally sized 50 - 350 µm of internal luminal diameter are relatively small with sparse layers of vascular smooth muscle, and tend not to develop significant myogenic tone compared to skeletal muscle arterioles. We thus induce pre-constriction of these small arterioles using ET-1 before exposure to vasodilators. We find that ET-1 exerts a more predictable vasoconstrictor response while in some cases there may be variability in responses to alpha receptor agonists such as phenylephrine. It is imperative to choose the appropriate agonists to induce a desired ~55% pre-constriction; however it is also critical to select the correct amount of pre-constricting agent to prevent over dosage and toxic damage to the vessel. We achieve this by starting with the lower range dose and up-titrating to effect as described in section 4.1.2. Arterioles in adipose tissue are sensitive to the changes in pH and temperature;14 therefore, it is crucial to monitor and control the appropriate pH (7.4) and temperature (37 °C) during the experimental process. While videomicroscopy is a tightly regulated temperature controlled system, it is imperative to monitor the pH of the KREBS solution throughout the experiment to avoid shifts that may skew results. Continuous bubbling of the KREBS solution and replacement of solution every 15 min during pressurization and washing steps will reduce pH variations over time. While videomicroscopy is a useful technique to examine the functional properties of microvessels, the technique has a substantial learning curve and may be labor intensive particularly during the process of vascular isolation. Depending on the type of tissue that is biopsied, our experience with adipose tissue microvessels has demonstrated that the cannulation procedure may take significant amount of time and patience. Additionally, there is inherent time sensitivity to the experiments as vessels outside the body tend to lose their physiological and functional properties over time. 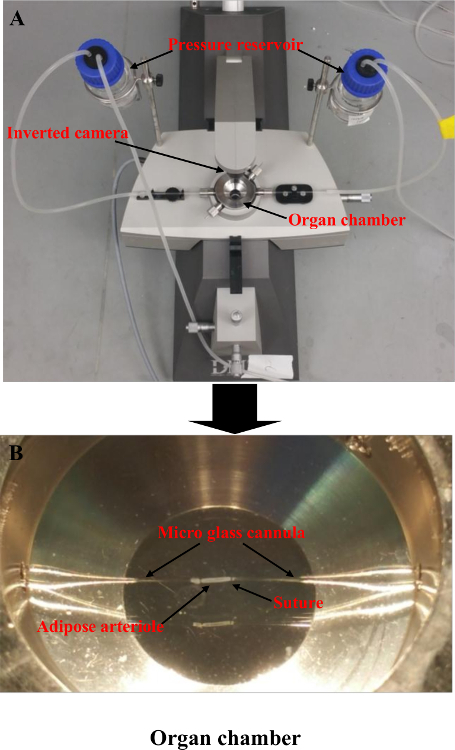 Thus, the experiments need to be performed within the viable window of the vessels of minutes to hours after surgical biopsy prior to eventual tissue decay. Authors have no disclosures or conflicts of interest to report. The authors would like to thank the volunteers for their participation in these studies and the surgical staff at the Boston Medical Center for providing adipose tissue biopsies. Dr. Gokce is supported by National Institutes of Health (NIH) grants HL081587, HL114675, and HL126141. Dr. Farb is supported by NIH grant K23 HL135394. Schubert, R., Mulvany, M. J. The myogenic response: established facts and attractive hypotheses. Clin Sci (Lond). 96, (4), 313-326 (1999). Jadeja, R. N., Rachakonda, V., Bagi, Z., Khurana, S. Assessing Myogenic Response and Vasoactivity In Resistance Mesenteric Arteries Using Pressure Myography. J Vis Exp. (101), e50997 (2015). Gutterman, D. D., et al. The Human Microcirculation: Regulation of Flow and Beyond. Circ Res. 118, (1), 157-172 (2016). Fuster, J. J., Ouchi, N., Gokce, N., Walsh, K. Obesity-Induced Changes in Adipose Tissue Microenvironment and Their Impact on Cardiovascular Disease. Circ Res. 118, (11), 1786-1807 (2016). Farb, M. G., et al. Reduced adipose tissue inflammation represents an intermediate cardiometabolic phenotype in obesity. J Am Coll Cardiol. 58, (3), 232-237 (2011). Farb, M. G., et al. WNT5A-JNK regulation of vascular insulin resistance in human obesity. Vasc Med. 21, (6), 489-496 (2016). Durand, M. J., Phillips, S. A., Widlansky, M. E., Otterson, M. F., Gutterman, D. D. The vascular renin-angiotensin system contributes to blunted vasodilation induced by transient high pressure in human adipose microvessels. Am J Physiol Heart Circ Physiol. 307, (1), H25-H32 (2014). Farb, M. G., et al. Cyclooxygenase inhibition improves endothelial vasomotor dysfunction of visceral adipose arterioles in human obesity. Obesity (Silver Spring). 22, (2), 349-355 (2014). Park, S. Y., et al. Impact of age on the vasodilatory function of human skeletal muscle feed arteries. Am J Physiol Heart Circ Physiol. 310, (2), H217-H225 (2016). Ives, S. J., et al. 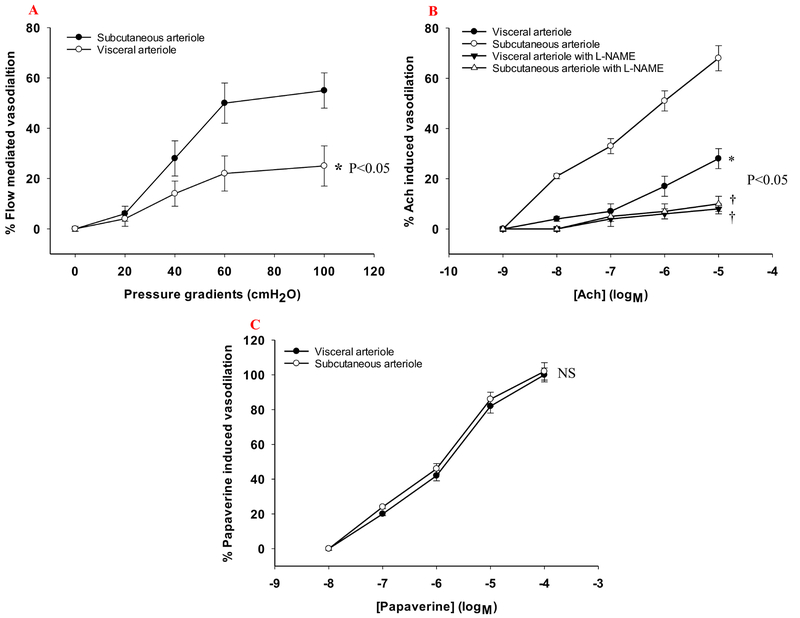 Human skeletal muscle feed arteries studied in vitro: the effect of temperature on alpha(1)-adrenergic responsiveness. Exp Physiol. 96, (9), 907-918 (2011). Grizelj, I., et al. Reduced flow-and acetylcholine-induced dilations in visceral compared to subcutaneous adipose arterioles in human morbid obesity. Microcirculation. 22, (1), 44-53 (2015). Farb, M. G., et al. Arteriolar function in visceral adipose tissue is impaired in human obesity. Arterioscler Thromb Vasc Biol. 32, (2), 467-473 (2012). Tanner, M. J., et al. Dynamin-Related Protein 1 Mediates Low Glucose-Induced Endothelial Dysfunction in Human Arterioles. Am J Physiol Heart Circ Physiol. (2016). Ives, S. J., et al. alpha1-Adrenergic responsiveness in human skeletal muscle feed arteries: the impact of reducing extracellular pH. Exp Physiol. 98, (1), 256-267 (2013). Dharmashankar, K., et al. Nitric oxide synthase-dependent vasodilation of human subcutaneous arterioles correlates with noninvasive measurements of endothelial function. Am J Hypertens. 25, (5), 528-534 (2012). Truran, S., et al. Adipose and leptomeningeal arteriole endothelial dysfunction induced by beta-amyloid peptide: a practical human model to study Alzheimer's disease vasculopathy. J Neurosci Methods. 235, 123-129 (2014). Karki, S., et al. Forkhead box O-1 modulation improves endothelial insulin resistance in human obesity. Arterioscler Thromb Vasc Biol. 35, (6), 1498-1506 (2015). Shahid, M., Buys, E. S. Assessing murine resistance artery function using pressure myography. J Vis Exp. (76), (2013).